The FastCV™ SDK supports Android OS 2.1 and above. The recommended development environment is Microsoft Windows 7 32/64bit or Windows XP. The components to build the actual code (JDK, Eclipse+ADT and gcc) are available across multiple platforms. While building on Linux Ubuntu and Mac OS X environments is possible, we will be unable to support those platforms with detailed documentation. However, we have included hints and notes to platform specific issues that will help you set up your development environment on Linux Ubuntu 10.10 or Mac OS X 10.6 (Snow Leopard). This set-up guide has been written for the Win7 32/64bit platform with special notes for WinXP. NOTE: If you already have both the Android SDK and the NDK setup, then please go directly to Installing the FastCV SDK. The FastCV SDK requires both the Android SDK and the NDK. The Android NDK is an extension to the Android SDK that lets Android developers build performance-critical parts of their applications in native code. SDK and NDK communicate over the Java-Native-Interface (JNI). Click the 'Download' button from the JDK section of the 'Java Platform, Standard Edition' table, JavaSE7. MAC: The JDK is already integrated into the Mac OS X operating system. NOTE: You may use other versions of Eclipse too, but our setup guide assumes this package! Unpack the downloaded ZIP package and copy the contents of the archive starting with the subdirectory 'eclipse' to your program directory path in C:\Program Files\eclipse. You may also create a shortcut to eclipse.exe on your desktop or start menu. The very first time that Eclipse is started, the IDE will ask you to assign storage space for your workspace. This directory will contain ONLY IDE specific settings and information. This is not your application development workspace (despite the notice in this window). This type of information is typically stored in the user's home directory, which is the default value here:C:\Users\USERNAME\workspace. Check "Use this as the default and do not ask again". MAC: For Mac OS X we recommend that you use the 32-bit version of Eclipse. The FastCV SDK uses r10 of the Android SDK. Unzip the archive and copy the contents into a directory, Ex. C:\Development\Android\android-sdk-windows\. NOTE: Do not use pathnames with spaces. 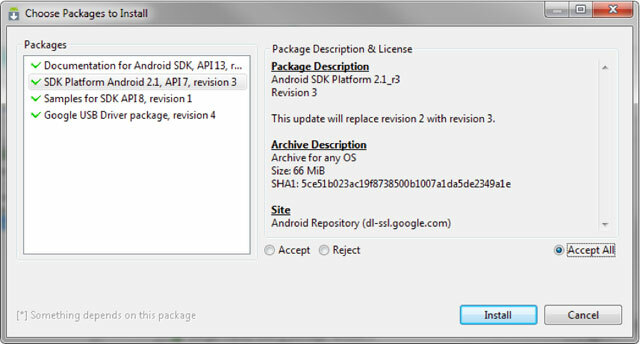 Android ADT installation in the next step will use this path to identify the Android development environment. into Work with field. Eclipse will ask you to provide an arbitrary name for the update site. After a short while Developer Tools appears in the field. At the very minimum, please select Android Development Tools and Android DDMS - which adds debugging support - from the list, and then click on Next-> . After reviewing this selection and accepting the license terms, the downloader fetches the files and puts them in your Eclipse directory. After accepting the certificate and an automatic restart of Eclipse, the installation of the Android ADT is complete. To develop for Android, support for the appropriate Android platform must be installed. 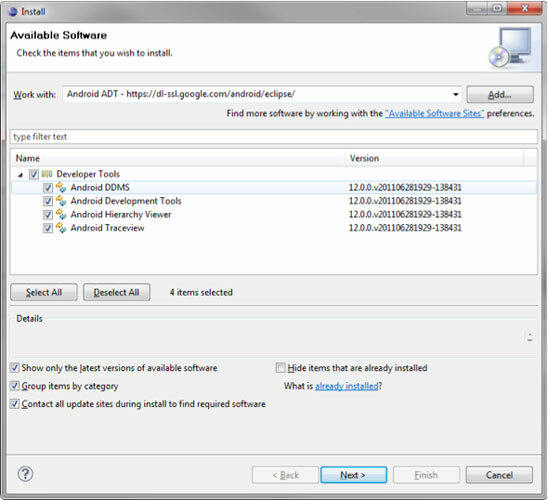 The Android SDK and AVD Manager is used to install additional components and support for different platforms. There are two methods to invoke the SDK and AVD Manager. Start the SDK SDK Manager.exe from the root of the SDK setup directory, or select in Eclipse the menu Window->Android SDK and AVD Manager. 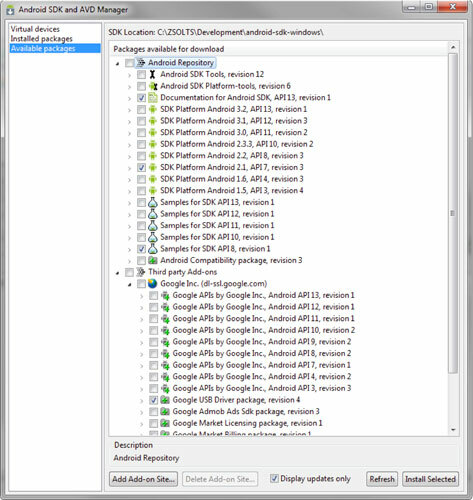 In case the Android SDK location was not setup correctly within Eclipse, go to Windows->Preferences->Android and set the SDK location field to the root of your SDK install directory. To install the selected options you must hit Install Selected and accept all licenses on the next window. Use Accept All as a shortcut and hit Install. The Eclipse environment is now ready for Android development. LINUX: This section is not relevant for Linux users. MAC: This section is not relevant for Mac users who have Apple Developer Tools (XCode) installed. Install XCode if necessary from http://developer.apple.com/xcode/. A GNU compiler is required to compile dynamic applications as shared libraries for the Android NDK. Android make files are designed to run with gcc4. On Windows, a convenient way to have the complete environment prepared for this, is to install Cygwin - currently version 1.7.9-1. Cygwin uses an installer helper to manage the installation process. Go to http://www.cygwin.com/ and select "Install or update now!" below the introduction, or use the direct linkhttp://www.cygwin.com/setup.exe. Click Setup.exe and select "Install from Internet" when prompted at "Choose A Download Source" in the installer. We recommend not changing the Root Directory in the next window, and leaving it at "C:\cygwin". The "Local Package Directory" holds the downloaded packages. You may want to keep them with the downloaded Setup.exe in the same directory so as to have a Cygwin installer directory. Choose a download site with a known fast connection near you. All -> Devel -> "make: The GNU version of the 'make' utility"
Select the word "skip" to change it to the actual version number, which is currently 3.81-2. Finish the installation by clicking next. Your Cygwin environment is fully set-up to work with the FastCV SDK. If you have other similar environments installed, make sure to set your Windows path variable to point to "C:\cygwin\bin" so that bash uses this version of GNU's make.exe. The current version is r6. Unzip the archive and copy the contents into a directory. To be consistent with our previous setup we recommend that you put the contents in "C:\Development\Android\android-ndk-r6\". Thus Android SDK and Android NDK share the same parent directory. We will later add the FastCV-SDK and your project files here. NOTE: Path has semicolon at the beginning. Do not use pathnames with spaces. Alternatively, you can also set a User variable with the name Path, but this is only valid for the current user. The last "\" at the end of the Path variable has to be included. The compiler should produce a dynamically linked library libsanangeles.so and write it to/libs/armeabi within the application directory. NDK-r6 includes support for different architectures so you might find different subdirectories in /libs. Now your development environment is ready to host FastCV SDK related content. 2. Project->Clean...->Clean All Projects should fix these errors as Eclipse has to build some standard directories. This also creates the APK package for deployment. If you get an error saying C/C++ primitives not found, you might have to include the include folder of your ndk directory under project properties. 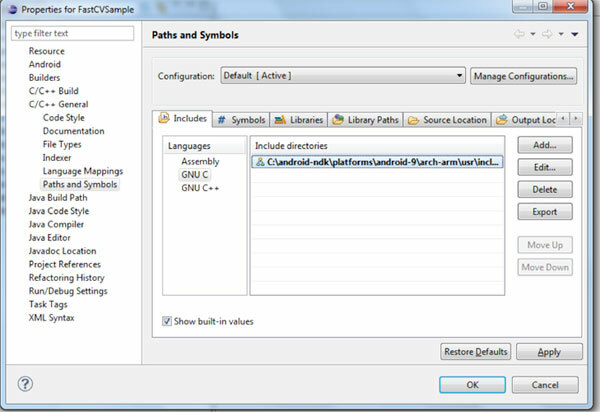 To do so, right click on Project->Properties->C/C++ General->Paths and Symbols. The apk should be inside the \bin\ directory. The app has been successfully built. docker "No ElasticSearch Node Available"